Item number Ie327 a-e from the MOA: University of British Columbia. A rattle made of four tubular seed pods (parts b-e), each about 31 cm. Long with a 2 cm. diameter, dark brown and loosely bound together with coarse plant fibre cord ( part a). The tubes have seeds inside. 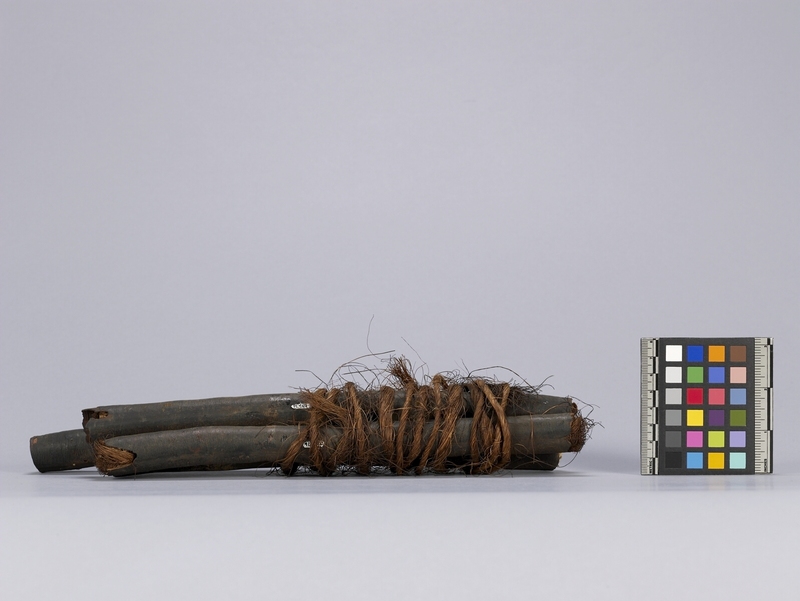 The end of one tube (part b) is plugged with plant fibre like the cord, the end of the next tube (part c) is plugged with white plant pulp while the end of another tube (part d) is plugged with soft brown paper (? ), and the end of the last tube (part e) is plugged with paper(?) at one end and plant fibre or bark at the other. Musical instruments used in dancing in the Rupale song and dance type associated with pig kill. Men hold weapons and perhaps a rattle which they slowly shake in time with the tramping.